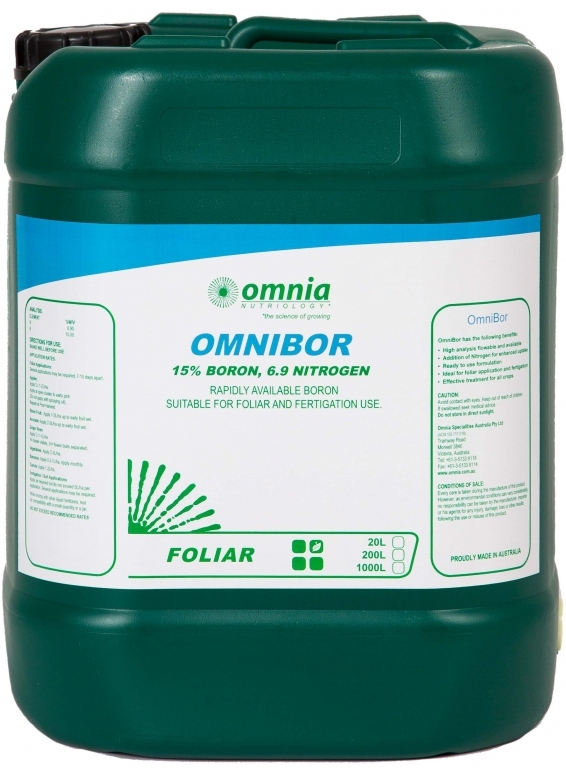 Effective Boron and Nitrogen suitable for all crops. Apply 2 x 1-2L/ha. Apply at open cluster to early pink (Do not apply with spraying oil). Repeat at post harvest. Apply 1-2L/ha. Apply up to early fruit set. Apply 2-3L/ha up to early fruit set. Grape Vines: Apply 2 x 1.5L/ha. 1st cluster visible, 2nd flower buds separated. Apply 1-2L/ha. Fertigation / Soil Applications: Apply as required but do not exceed 5L/ha per application. Several applications may be required. Apply as required but do not exceed 5L/ha per application. Several applications may be required.